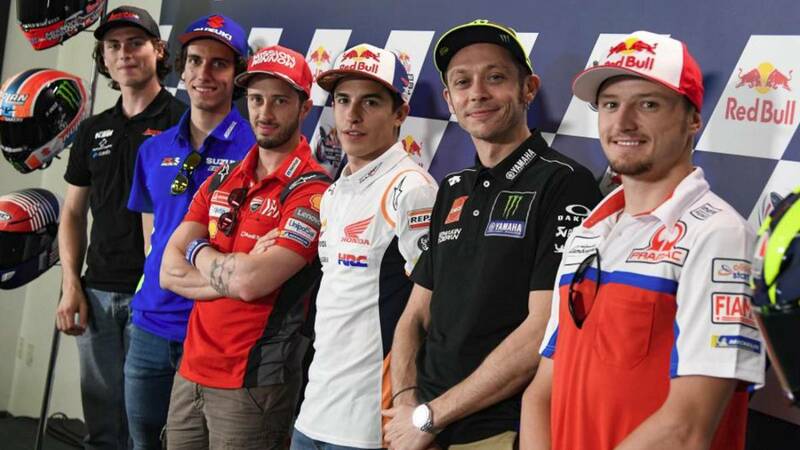 Home Moto Rossi, Márquez and Rins agree: "Bautista does not win by motorcycle"
Rossi, Márquez and Rins agree: "Bautista does not win by motorcycle"
These three pilots, questioned by As in the GP of the Americas, agree that the Talaverano does not win for the bike in Superbike. The spectacular start of Alvaro Bautista in the SBK, with nueve wins of nine possible in his debut, mama even the attention of the stars of MotoGP. Rossi, Márquez and Rins have been asked by As about the taraverano and all agree that he does not win by the bike, that fantastic Ducati Panigale V4 R, which is the envy of his main rivals on the grid. Márquez says : "I like the engine and Superbike and we follow Bautista, because he is Spanish and he comes from racing in MotoGP, to be world champion . It is clear that he does not only do it by motorbike, since I have heard this comment, he wins by A pilot does not win just for the bike, when everything helps, and a pilot like Bautista who has been champion of the world finds the atmosphere and the taste, because he is capable of doing things like these. last year and in the other races, he did very well. " And by reminding him that he has removed 250 revolutions to the engine of the Panigale, by regulation, to try to match forces with his competition, the MotoGP champion sarcastically assures that "yes, well, instead of ten will be five seconds that goal ". Questioned Rossi for it, he assured:" It is quite impressive what Bautista is doing with the Ducati. He was sure that he would be strong, that he could fight Rea, but instead has shown a superiority . The bike sure is going strong, but it's not just that. He seems to be driving well. The whole package works, but he does more and he is the one that makes the difference. " And when asked about the place where the SBKs are, he replied:" It's hard to say. We will need to see. There are also strong pilots in SBK "Rins, meanwhile, is also aware of the feat of his compatriot: " It's amazing. Bautista is a great pilot. He showed it here for so many years and achieved the 125 World Championship. It's incredible that he now has 9 out of 9 and we have to see what Assen has to offer this weekend. I'm not very familiar with how your motorcycle and the others are. SBK is like MotoGP. There is no bad driver or any pilot that is about to be. Bautista is a very talented driver and he has arrived there and he is starting it. I am very happy for him ". Surely words like these will give Bautista extra energy in his attempt to sign this weekend in Assen on the back of his Ducati on twelve of twelve.